Background: Modified electrodes are a new approach to improving the characteristics of the electrochemical sensors. The high conductivity and low charge transfer resistance are the major properties of new mediators for improving electrochemical sensors. Metal-based nanoparticles showed good electrical conductivity and can be selected as the suitbale mediator for modified electrodes. 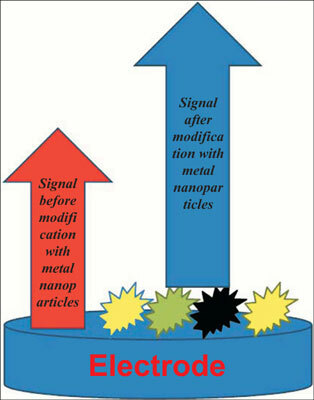 Objective: Recently, metal-based nanoparticles, such as Au nanoparticle, TiO2 nanoparticle, Fe3O4 nanoparticle and etc. were suggested as the suitable mediator for modification of solid electrodes. The high surface area and low charge transfer resistance of metal-based nanoparticles, suggested the exceptional intermediate in the electrochemical sensors. Here, we tried to consider these exceptional effects through reviewing some of the recently published works. Metal-based nanoparticles, electrochemical sensors, Conductive mediators, modified electrodes, solid electrodes, DNA biosensors.